Gideon was a decorated cop, until he took the law into his own hands to bring down the man who murdered his wife, getting himself killed in the process. Sent to Hell for his sins, Gideon became a Ferryman, a bounty hunter for Lucifer. 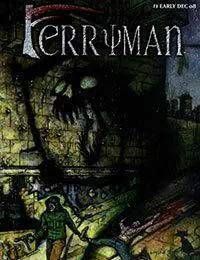 When people make deals with the Devil—strength, beauty, wealth and power in exchange for their souls—the Ferryman is the one who comes to collect. The souls, imbued with incredible supernatural powers because of their arrangements with Satan, don't go easily. But Gideon is the best Ferryman in the Devil's army, and he drags the souls back to Hell in one explosive showdown after another. After decades of retrieving lost souls, Gideon wants Lucifer to keep his end of the bargain: to release Gideon from his contract and allow him to go to Heaven, where he can finally be with his wife. However, the Prince of Lies has one last job for Gideon. He wants him to find the Outcast, a soul that has destroyed countless Ferrymen and eluded Satan for thousands of years. It is the most dangerous mission of Gideon's life, one that will take him across the globe and into his own dark past, ultimately revealing an ancient mystery that threatens the very foundations of Heaven and Hell.